The Order of Mata Nui-Brotherhood of Makuta War, also called the Destiny War by Helryx, was a large-scale conflict between two of the most powerful factions in the Matoran Universe, the Order of Mata Nui and the Brotherhood of Makuta. The Order, long kept a secret from the rest of the universe, chose to leave their secrecy behind and openly engage the Brotherhood in combat. Several other, smaller, organizations were thrust into the outbreak, siding with either the Order or the Brotherhood. The war came to an end in a battle on Metru Nui, and the Brotherhood of Makuta was finally defeated. The Order had long been aware that they would someday need to reveal themselves and fight the Brotherhood. After the events in Mahri Nui concerning the Kanohi Ignika, the Order began to prepare for the inevitable conflict. In order to reduce the creation of Rahkshi, the Order began locating and destroying Energized Protodermis pools in which Rahkshi are created. Takanuva was sent to Karda Nui to inform the Toa Nuva of the Energy Storms that would begin once Mata Nui was awakened. The Order recovered a disgraced member, Brutaka, from the Pit and sent him on a mission to free the former leader of the Brotherhood of Makuta, Miserix. Once freed, Miserix began his long-awaited hunt for Makuta Teridax. Toa Krakua was sent to Voya Nui to contact Axonn and bring him to their base on Daxia, where he was reunited with his friend Brutaka. The Brotherhood of Makuta had also made plans, with the goal of conquering the Matoran Universe. Over a significant length of time, Makuta Tridax used a Kanohi Olmak to travel to alternate dimensions and kidnap various incarnations of Takanuva, whom he then drained of Light to create an army of Shadow Toa. Rahi flew to the Dark Hunter's base on Odina and began to fly in a pattern recognizable only to the Order of Mata Nui's spy in the organization. The spy, Ancient, went into the Odina Fortress to confront the leader of the Dark Hunters, The Shadowed One. Without revealing his true allegiances, Ancient managed to convince him to form an alliance between the Hunters and the Order. The Order of Mata Nui dispatched the insane half-Skakdi, Vezon, and Trinuma to the Brotherhood base at Destral, where Vezon was to infiltrate the fortress by pretending to betray the Order. He was to also learn the secret of Destral's teleportation. The Order then sent the Shadowed One with a fleet of Dark Hunter ships to blockade the island of Xia so they could stop the Vortixx from selling weapons to the Brotherhood. The Shadowed One instead decided to completely obliterate the Xians, but before he could do so, the Toa Hagah intervened. The Dark Hunter leader still tried to go through with his plans, but Toa Helryx appeared and threatened to wipe out the entire Dark Hunter armada if they went against her orders. Helryx then dispatched the Toa Hagah with the aid of Zaktan to locate Makuta Teridax and defeat him. The Dark Hunters proceeded to occupy Xia. Axonn and Brutaka were sent to the island of Zakaz to recruit the Skakdi warlords, including Nektann, to join in the war effort on behalf of the Order. Nektann agreed to ally with the faction because of his troops' hatred of the Brotherhood of Makuta and their lust for battle. With the combined might of many of the universe's greatest forces, the Order of Mata Nui initiated their attack. The Brotherhood of Makuta secretly placed a small army of Rahkshi on one of the Southern Islands to stage an invasion of the Southern Continent, and they succeeded in driving off all the Matoran residing on the island. However, before the Rahkshi could initiate their attack, armies of Skakdi arrived and they did battle. Although the Skakdi were outnumbered and suffered loses, they managed to muster their forces and rip through the army of Rahkshi. While the two forces battled, Axonn and Brutaka were sent to the same island to destroy the original pool of Antidermis that birthed the Makuta. However, they were unable to do so after the antidermis swallowed them and became linked with Brutaka's mind. Using his Olmak, he teleported Axonn and himself to the Core Processor, far beneath the Coliseum. All across the universe, the Order of Mata Nui launched surprise attacks on the Brotherhood of Makuta and used their allies to conquer key positions throughout the domed universe. The Brotherhood was taken unaware and lost their footing in much of the universe, though managed to keep up a resistance effort. The Order was unable to remove the Makuta army on the island of Nynrah for some time. The War took place over many islands and many parts of the universe, with battles raging from Nynrah to the Southern Islands. The Order won many of these battles. Helryx operated the War mostly from her chamber on Daxia. After the War had began, she made two vital decisions. One was to send the Heart of the Visorak to the Toa Mahri on the island Metru Nui. The second was to order Hydraxon, the jailer of the Pit, to free the Barraki on the condition that they join the Order of Mata Nui's armies. Hydraxon deliberated for a time, and eventually told the warlords that they would either be freed and fight with the Order or face a worse punishment. Pridak immediately agreed, and began to strike at the Brotherhood with an army of Skakdi, Vortixx, and rogue Dark Hunters. Pridak was victorious in one such battle, where his legion overtook a Makuta Fortress. When he examined a shattered wall, Pridak discovered Teridax's complete plan. When the Barraki learned that the Shadowed One had unearthed Makuta viruses, Kalmah, Mantax, and Ehlek traveled to Xia on Pridak's behalf and negotiated with the Shadowed One to form an alliance in Karzahni. The agent Johmak traveled to Metru Nui and delivered the Heart of the Visorak to the Toa Mahri. She told them to take it to the southern island of Artidax. Two other Order members already went to the island and planted explosive devices intended to utterly destroy the Brotherhood's army of spider Rahi. However, only Jaller, Hahli and Nuparu went on the mission, leaving Hewkii and Kongu to guard the city, which was not what the Order wanted. Jaller, Hahli, and Nuparu met Takadox soon after arriving on Artidax, who then placed them in a trance as he escaped the island on their Boat. They were saved, however, when Makuta Teridax made his first known involvement in the War, jolting Jaller awake so that the Toa Mahri were able to flee the island. The volcano then erupted, killing the entire Visorak horde. 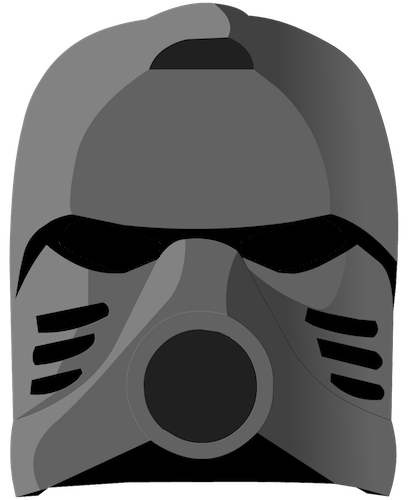 The Order soon recruited Keetongu as an ally, after promising him that the Visorak had been eradicated. Knowing that the Toa would interfere with their plans to fortify Metru Nui, Hewkii and Kongu were temporarily abducted. After the Toa Mahri were removed from Metru Nui by Johmak, the Order began to fortify the city's defenses by building large walls and sentinels around Metru Nui's coastline, making the island city into a fortress. The Turaga disagreed with the Order but could not stop them, and the Matoran were put to work in the effort. Agents on Stelt began leaking rumors that the Great Furnace on Metru Nui was being converted into producing a virus that could destroy Makuta armor, luring a final battle to Metru Nui. The Brotherhood of Makuta had kept a strong resistance of Rahkshi and Exo-Toa on Nynrah, which had held for most of the War. The Order of Mata Nui did eventually defeat the Brotherhood's forces on the island, leaving Rahkshi parts scattered across the beach. After the Order's victory, Helryx and Keetongu came to the island, where Helryx used her mask to examine the Rahkshi's remains, searching for the pools of Energized Protodermis they were created in. One piece of armor revealed to her a pool on an island to the south. Together, they went to this island to destroy the pool, but were confronted by an entity entirely composed of Energized Protodermis. The entity sent a wave of its substance at Helryx and Keetongu, but the two escaped through a sudden dimensional portal conjured by Vezon. The Order of Mata Nui began a surprise attack on the Brotherhood's base just as Makuta Tridax was about to execute the captured Vezon. The large assault freed Vezon from his chains, and so he began the next step of his mission. Tridax had been given orders to move Destral to Metru Nui and seize the island city if such an attack occurred. However, he was followed by Vezon to Destral's teleportation chamber. Tridax revealed to Vezon that he simply had to release his Toa army, and they would easily defeat the opposing armies on Destral. Two agents of the Order, Tobduk and Mazeka, then entered the chamber, and Tobduk proceeded to kill Tridax. Mazeka was intended to kill Vezon, but decided to let him live. The Order agents then departed as the fortress began to crumble. Vezon contemplated taking control of the Toa army, but instead stole Tridax's Olmak and inadvertently saved Helryx and Keetongu by transporting himself onto the island of Energized Protodermis. The majority of the Shadow Takanuvas were killed in Destral's destruction, but some survived. The last battle of the War was a massive siege of Metru Nui by the Brotherhood's Rahkshi. The Rahkshi managed to break into the city, but various setbacks prevented them from completely taking over. The Toa Mahri returned, and convinced Krakua to awaken the Bohrok under Metru Nui, who held back the Rahkshi. When Mata Nui awoke, a storm began that rocked the Brotherhood ships besieging the city. With the timely arrival of the Toa Nuva in their aircrafts, the Brotherhood forces were destroyed and repelled and the organization ultimately crushed as a result. Much of the buildings across the universe were left in bad shape after the fighting. Once Teridax assumed control of Mata Nui's body, he forced some of the remaining Makuta to produce many Kraata and Rahkshi, then eliminated them. He also destroyed the Order base on Daxia, killing many of their agents. This page was last edited on 25 July 2017, at 09:47.